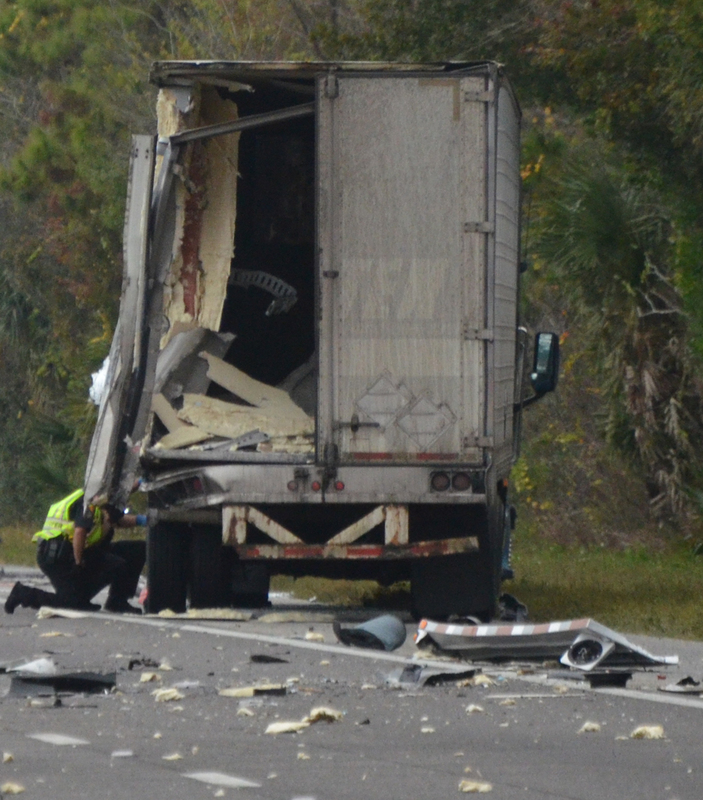 A wreck involving two tractor trailers and resulting in the death of 41-year-old Christopher James McEuen of Jacksonville shut down I-95 in both directions in Palm Coast at 3:45 a.m. Tuesday. I-95 northbound will not re-open until at least nightfall on Christmas Eve. One of the trailers was a fuel truck. 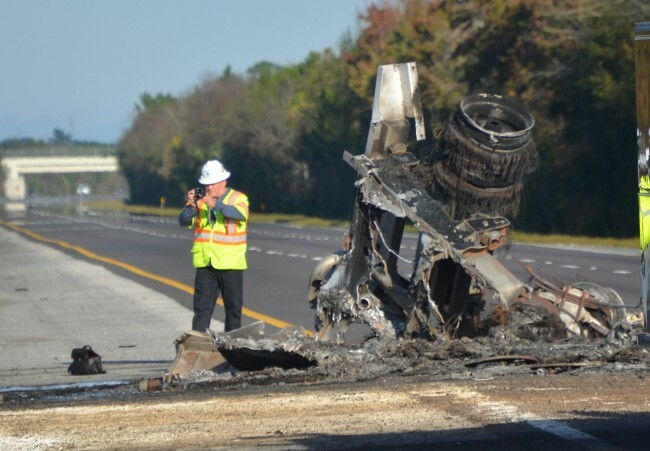 It struck the other trailer, rolled over, and exploded in the collision, officials said, killing the driver and spilling the flaming fuel onto the highway, which sustained severe damage around mile marker 291 on I-95. 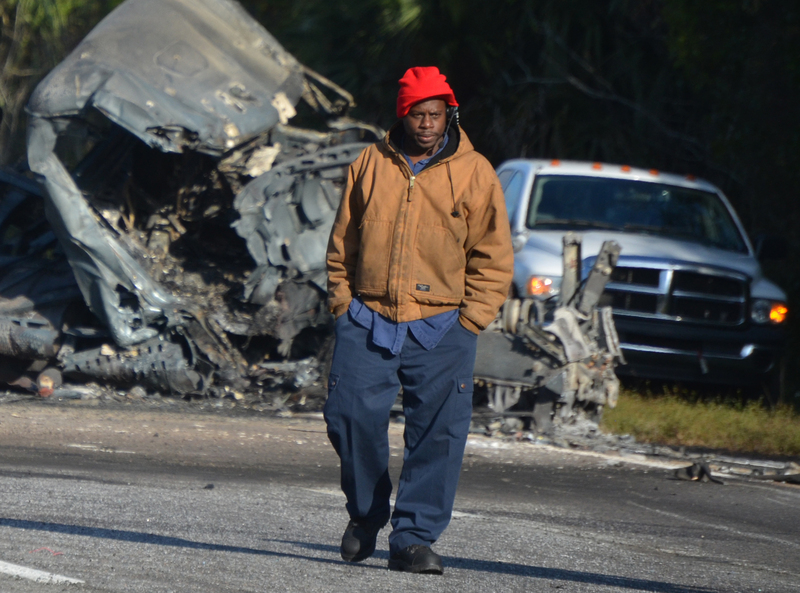 The second driver, 33-year-old St. Clair Agenord of Winter Haven, was not hurt, and was at the scene, cooperating with investigators–until he was arrested on an out-of-county warrant and booked at the Flagler County jail at 11:10 this morning. Gaston said Agenord was arrested on a “minor” misdemeanor: non-payment of child-support. He was being held on $2,000 bond. 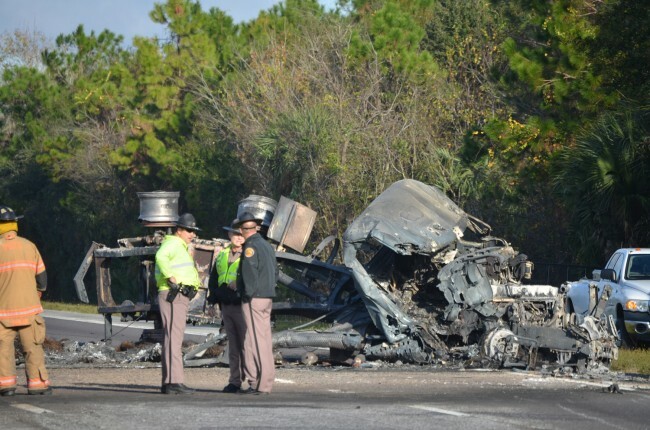 No other vehicles were involved, Florida Highway Patrol Capt. Keith Gaston said. 911 Wreck Call, 3:45 a.m.
Further investigation indicated that the tanker rear-ended the other truck, which was empty. Agenord was traveling north in the right lane of the three-lane highway. So was McEuen, whose tanker struck Agenor’s trailer on its left rear. 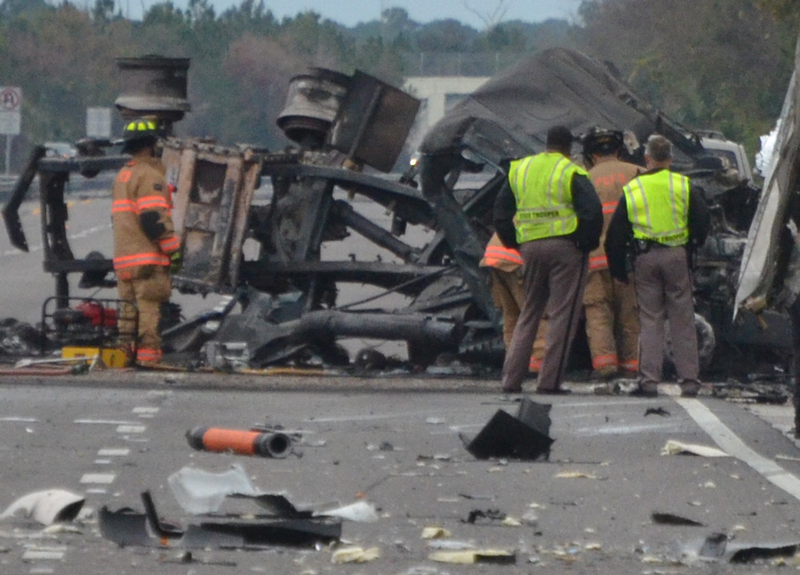 “The driver of the tanker was unable to exit,” FHP reports, and was killed in the wreck. McEuen’s tanker was registered to Florida Rock and Tank Lines Inc., of Jacksonville. McEuen was originally from Akron, Ohio. 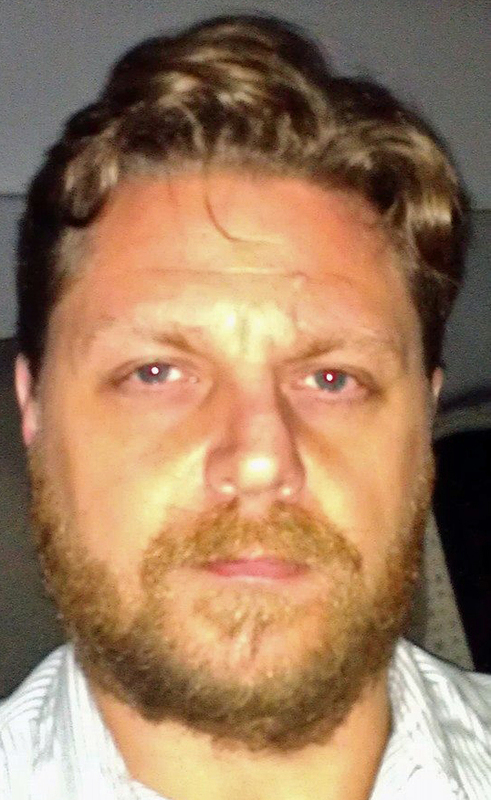 He’d been driving for Rock and Tank Lines since February 2012, according to his Facebook profile. 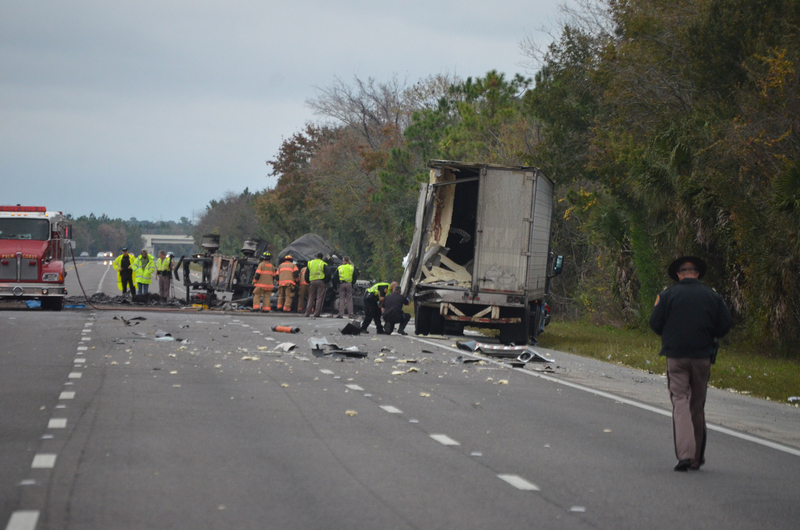 The northbound lanes of I-95 were to be closed for the day. The fire has damaged the asphalt to the point that it will have to be replaced, Gaston said, describing the scene as devastating. The southbound lanes were to reopen sooner. Additional 911 Calls, 3:45-3:47 a.m. Speaking to a reporter at noon, Gaston said the wrecked truck began to be moved only at around 11:30 a.m. Road repairs had not yet started just then. “We’ve got a crew in route and they’ve got all the other things to get started when we can,” Gaston said, “so we’re probably looking at 5 or 6 tonight at the earliest that we’ll be open. That depends on what we find.” If the damage to the road is more severe, or requires such things as further environmental clean-up, the delay will be extended. Palm Coast Fire Chief Mike Beadle said his crews arrived on scene shortly after the explosion and the fire started, but were held back half a mile away from it until authorities could figure out what sort of fuel was burning. “Once we found out it was gasoline, there was no danger for anyone,” Beadle said. Sixteen firefighters were on the fire. The fire was allowed to burn itself out, Beadle said, which is normal procedure in this sort of situation, as crews worked to contain it, then throw foam on it. The fire was out by about 6:15 a.m. But it consumed the roadway down to the roadbed, making it impassable. 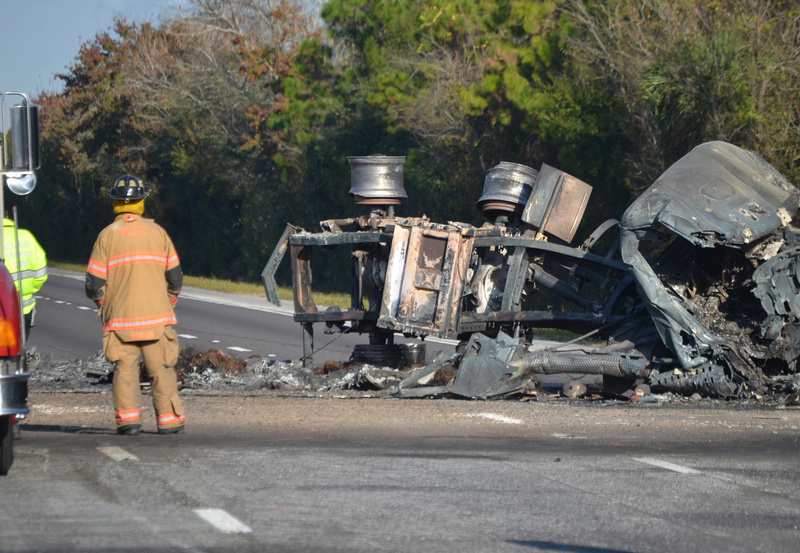 The Palm Coast Fire Police is rerouting northbound traffic off I-95 at Exit 289 (Palm Coast Parkway). Southbound traffic was rerouted off exit 298, but began to flow again at 6:10 a.m.
Media were held up from reaching the scene since 5 a.m., then taken to within 100 yards of the scene at 8 a.m. 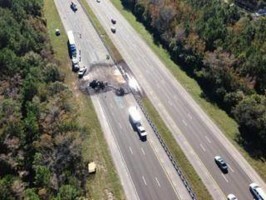 The Florida Highway Patrol is investigating. 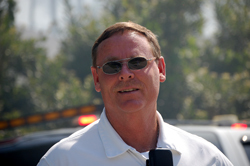 The original 911 calls reporting the explosion were received at 3:45 a.m. and were placed from the highway and from the F and B Sections, which are adjacent to the area of the crash, and where residents reported seeing flames they attributed either to a forest fire or to house fires. A caller from the Interstate described the crash accurately, between expressions of disbelief. Another caller reported two explosions. According to 911 records, dispatchers received calls from Frenora Lane, Birchwood Drive, Birshire Lane and Lakeside Place. Agenord himself called 911 and was already aware of the likely fatality of the other driver by 3:58 a.m.
At 4:22, authorities were calling for immediate help to redirect some 200 vehicles in I-95’s northbound lanes in the area of the crash, to turn them around back to Palm Coast Parkway and clear the road. 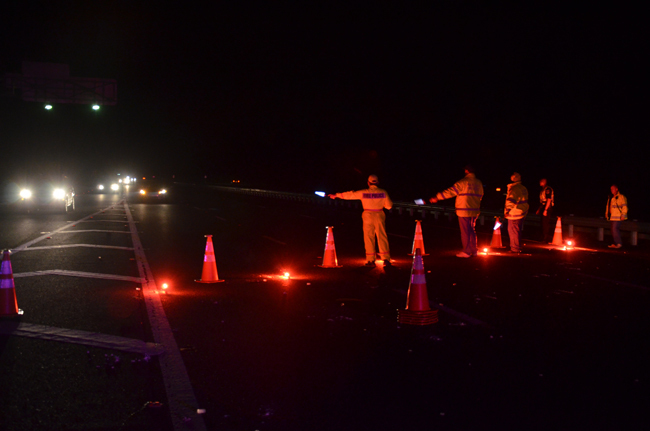 The highway was finally cleared at 4:50 a.m. By 5 a.m., authorities already knew that they needed to have I-95’s entrance at Palm Coast Parkway barricaded and shut down “for the majority of the day,” the notes indicate. The fire was almost out by 5 a.m.
At 5:07 a.m., four vehicles blew past the barricades and toward the wreck scene, without authorization. Police chased the vehicles, stopped the drivers at 5:25 a.m., and issued them each a citation. The four drivers in their cars were then escorted back south. Although one FHP official said at 8:15 that the northbound lanes would be closed for at least another two hours, another FHP official said that it could be longer than that, given what had just taken place at the scene: an official from the Medical Examiner’s office said he was not on his own able to remove and piece together the remains of the driver killed in the accident, and would have to wait for additional personnel from the office, including possible the medical examiner himself, to get to the scene and conduct some of the preliminary examination there. That means the road would remain closed until that operation is concluded–and until the roadbed itself is repaired. The St. Johns County Sheriff’s Air One helicopter crew took that image, showing the extent of the damaged highway around the wreck. Northbound traffic began to back up at the 289 exit around 6 a.m., and snarled south of the exit on what is one of the heaviest travel days of the year, but by 7:30 a.m. the back-up had dissipated. The Palm Coast Fire Department and Flagler County Fire Rescue responded, along with FHP, the Department of Environmental Protection and the Medical Examiner’s Office. The Flagler Beach Fire Department and Bunnell fire volunteers were also called up but were cancelled from the scene itself, and requested to stand by to cover other areas of the county in case of additional emergencies. Soon after 12:30 p.m., authorities were called to another wreck that was causing some road blockage at mile marker 281, also in the northbound lanes of I-95. The wreck proved less than serious. 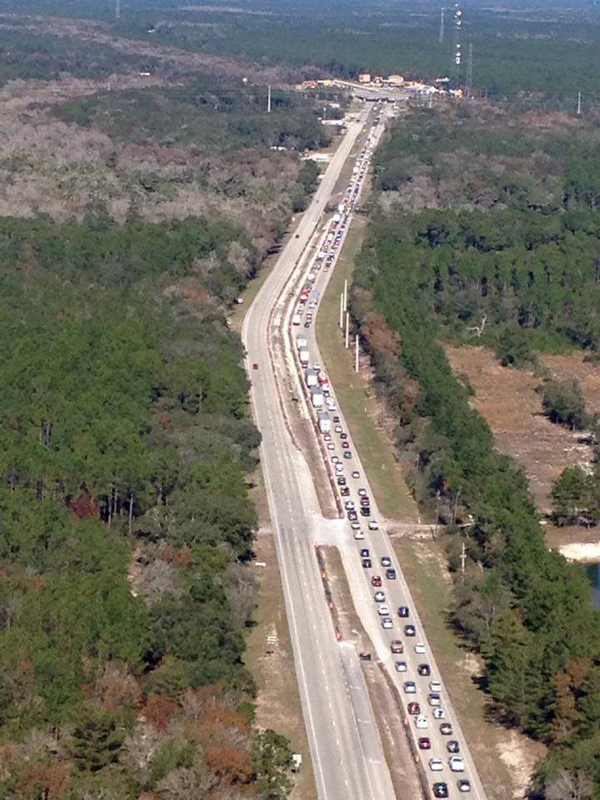 Traffic on U.S. 1 in an image provided by the St. Johns County Sheriff’s Office. 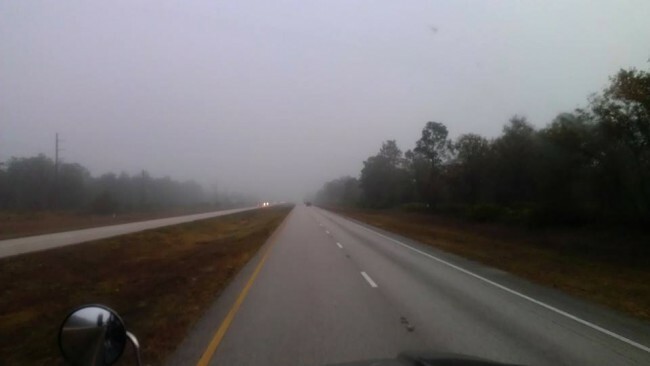 The view from Chris McEuen’s truck, in a picture he took of the fog on U.S. 301 and posted at his Facebook page on Dec. 4. Click on the image for larger view. Terrible, prayers to all involved. As usual, GREAT job covering this story by Flagler Live.. I heard a loud pop about 3:30 and thought anything that loud can’t be good this early. I left for my house about ten mins later and the entire sky was orange. As I passed on Old Kings, I could see flames well above the trees. It was very surreal. So sad about the driver, hope his family is alright on Christmas! But I’m thankful no homes were compromised either. to give these trucks a wide berth on the road. Transporting bulk liquid and gas is challenging in the best of conditions. In a panic braking situation, this type of load pushes forward unevenly as you’re decelerating. My sympathies to the driver’s family. Most fuel tanker companies are on electronic logs so I highly doubt he was running past his hours. Why would you even say that. It’s not 1970, you have a minor amount of facts and how would you feel if it was your family or friend and someone that knows nothing about what happened started saying stuff like that. What if the other truck cut him off then panic breaker to avoid a car or deer and that’s what triggered it. I was a truck driver. The tanker driver should NOT have been following so closely that if he had to stop he couldn’t. Go fast, tailgate. Been there done that but thankfully didn’t have to buy the shirt. I am sorry for the driver’s family and friends. How horrible for this driver’s family…their holidays will now be forever burdened with this grief. And thank you to our local police and fire departments who are putting their lives on the line dealing with this situation today to keep the community safe while the rest of us are baking cookies and wrapping presents (which I’m sure they wish they could be). No doubt the late driver was pushing long hours that his boss was pushing him to do. Is it just me or is American society getting ridiculous with working long hours, working while your off, working holidays, more shift work. Seems to be heading more and more nor being family friendly anymore. I was born and raised in America, but think we could take a lesson from Europe about disconnecting from the workplace to be more family oriented and to keep a piece of mind. I’m sure you take for granted the fact that you are able to actually get gas when you go to a gas station. Also, there are strict federal laws that require very frequent breaks for truckers transporting gas and other substances. Be careful where you cast blame when you are the consumer he was delivering for. Just think the number of people that could find jobs if companies would stop working the employees 12 to 16 hours per day. I hauled fuel a few years back and 12 hours per day was normal. Thank you Flagler Live for being on top of everything happening in our extended area. Very sad to think that this was the drivers fault because he was “pushing” his hours of service or is boss was making him do it. This was actually one of my husband’s drivers who passed. You should not make any comments until you know all the facts. Very ignorant comment. Prayers to the family members. Such a sad incident on Christmas eve. Just wished people would be more careful. When you wake up tomorrow morning, cherish every moment you have with your family. I also ask that you take a moment to think about this man, and what his family is going through and what will they go through each year at this time thinking about their son/brother/husband that they lost. This time of year is spent with so much hustle and bustle with getting gifts and focusing on so many other things that I hope we can all appreciate the time we have with the ones we love. Keep smiling, give everyone a big hug and don’t ever take tomorrow for granted. God bless everyone and Merry Christmas. May God be with this man and his family and all others affected by this tragedy. Something has to be done about those who exceed the speed limits, especially on I-95 and I-4, two of the most dangerous roads in Florida. And now several in the Florida Legislature want to increase the speed limit above 70mph. Remember our roads are not built like The Autobahn or The Autostrada in Europe. My thoughts and prayers go out to the family!! I am very sorry for Chris McEuen, and his loved ones. He was working… They both were… A life was lost and many more have been tragically affected. Why must any of us cast a stone? I have 5 brothers, all of which are/were truck drivers. Respect of the road; in a rig, car, truck it doesn’t matter. At some point in time, no matter what it is, it’s about respect for others in life and death.